Energy Savings in homes and work places. It is the only product in the world that can transform any existing switch into an energy saving switch within minutes, through the magic of wireless occupancy sensing technology that we have proudly innovated in India. 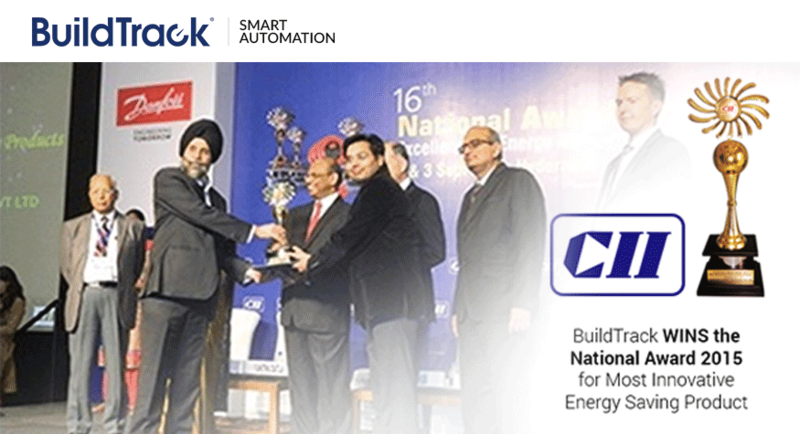 BuildTrack was an exhibitor at the CII 14th Energy Efficiency Summit conducted at Hitech City, Hyderabad. The event was held from 2nd – 5th Sep 2015. BuildTrack showcased its products during the event which included wireless occupancy and daylight sensors. This product has been awarded the Most Innovative Product of 2015 for enabling Energy Savings during the event. The turnout and the response from the visitors was tremendous. We thank all our clients for the encouragement and hope that with their support, BuildTrack could deploy these to make a significant contribution to energy efficiency in India, starting with all our homes and offices.